Start at signpost G49 Montagut and head for ‘La Mare de Déu de la Devesa i Baumes de Caxurma’. Pass by the swimming pool and then after a while pick up a bike lane. Continue along this bike lane, past signpost MiO8 Carretera de Montagut and on to the first houses of the residential area of La Cometa. Pass through the houses following the yellow Itinerànnia waymarking until you come out to the N-260A road; here, turn right until you reach the turning to the hamlet of Els Angles. Take this road, pass under the main road and the A-26 dual carriageway and continue as far as a ford over the river Fluvià. 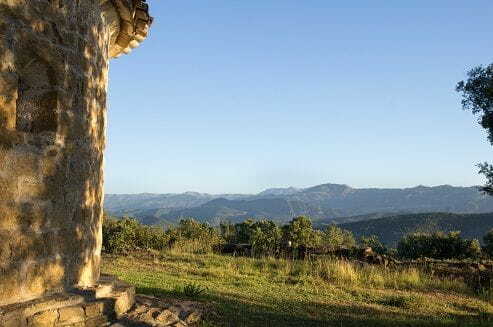 Continue straight on and after a little while you will come to signpost MiO1 Camí de la Devesa: turn and pick up a dirt track that heads into a splendid mixed oak forest. Continue along this track until where, at the first bend, you should take a footpath that begins to snake uphill, slowly gaining height. The deciduous oaks begin to give way to the holm oaks as you approach the small church of La Mare de Déu de la Devesa. Once at the church, turn right along a forest track until it starts to climb, at which point you should turn right along a path that heads into a thick forest. Continue on through a mixed forest of oaks and pines until you begin to come across a number of large rocks: at this point you have to be careful not to miss the caves (baumes) as they are hidden away to your right, well camouflaged between the oaks and rocks. Start to drop until you come to signpost MiO2 Torrent de Santaló, where you should turn right following the yellow Itinerànnia waymarking. Pass over the dual carriageway tunnels and pick up a service track until you are indicated to drop down to the left towards Castellfollit de la Roca. After a while you come to signpost MiO3 Les Hortes: turn right and follow the path alongside the allotments that gradually approaches the river Fluvià. Continue under the dual carriageway viaduct until you reach signpost MiO1 Camí de la Devesa again. From here, just retrace your steps back up to La Cometa and on to Montagut.